There are many places in the world to visit, but Alicante Spain has to be one of the best. This is a big time tourist area of Spain, and once you get here, you will understand why. There is so much to see and do here that you will have to make many trips to this area to get it all done. Today we are going to talk about some of the things you may want to check out when you are in the area. 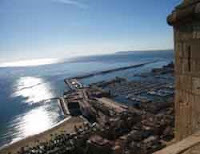 First of all, the Santa Barbara Castle is a must see when you are in Alicante. It is an amazing site to see, and it's right next to a beach. The beaches around this area are sandy and soft. Thus, it's the prefect place to relax after a long day of sight seeing. If you can get a hotel by the beach, then you are in luck. It's nice to get a room on the top floor and leave your window open as you sleep. The sounds of the waves will put you out in no time. While walking the streets of Alicante it is going to be hard to go home empty handed. They have a lot of great souvenir stalls located all over. After all, this is a tourist town. Most people end up leaving with a commemorative plate of General Franco. When you are done shopping, it will be time to get a bite to eat. There are a ton of great sea front restaurants that you can eat at for under €10. Most of the restaurants in this area serve three course meals, so the price is well worth it. You may even want to visit one of the local Irish pubs to help wash down that nice three course meal.